Among the many collaborative and productivity features of Microsoft Office 365, email service is one of the major ones. All emails exchanged via Office 365 is stored in the O365 mailbox. Like every other cloud data, the data of this mailbox also need backup. Why? You will soon know the answer as you will read in this post. Besides, we will also share the most convenient way to resolve how to backup and restore Office 365 mailbox items. But at first, we will learn the reasons why users may need to perform Office 365 mailbox backup and restore. Data backup means having another copy of data so that it can be used in case of an emergency. Similarly, Office 365 mailbox backup can save you from various drastic situations. Any natural or man-made disaster on the physical location as well as malware attacks can remove your data permanently from Office 365 account. Moreover, Office 365 data backup policy does not protect users from accidental or intentional deletion. Therefore in such cases, users remain vulnerable. To avoid permanent data loss, all Office 365 users should back up their mailbox data locally. They should also be equipped to restore the data backup when needed. We can see that having a complete backup of Office 365 mailbox is vital for every user. But for that, users must know the procedure of these two processes. We would like to present an application that can save the Office 365 mailbox data and upload it back when necessary. And, the tool is eMail Doctor Office 365 Backup and Restore. The biggest advantage of using this application is that this single utility can conduct both the tasks. It is also quite simple to operate this program. Now it is the time to learn how to backup and restore Office 365 mailbox. 1. 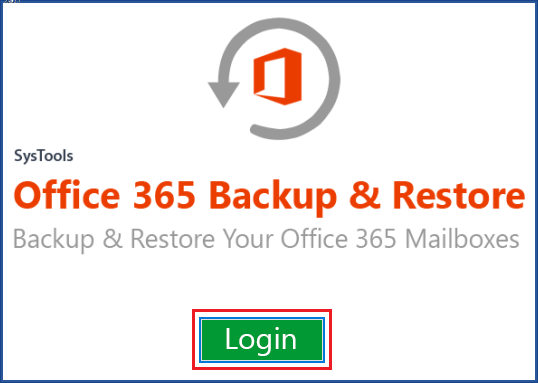 Launch the Office 365 Backup & Restore software and click on the Login button on the welcome screen. Download free trial from here. 2. Enter Office 365 credentials (username and password) on the next page. 3. 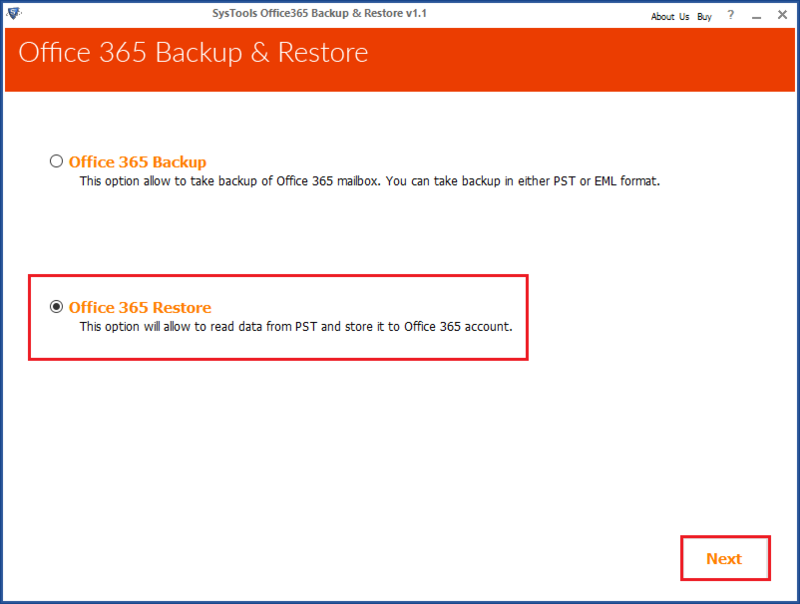 Choose Office 365 backup as you are about to save the Office 365 mailbox data locally. 4. A complete folder list of Office 365 account mailbox will get displayed on your screen. Select the folders you wish to backup. Click on the Browse button to select the directory path of local storage where the data will be saved. 5. Click on the Export button and a window will pop-up in front of you. On the window, users can Choose the format of emails backup, categories to be exported, naming convention to be applied, and date range (if the date based filter is needed). Finally, click on the Start button. 6. Once the backup process starts, you can see the progress report and the live status. During this stage, users can pause and resume the process if they want. When the backup is completed, a notification will appear. Users can visit the chosen location to check the downloaded PST file. How to Restore Office 365 Mailbox? 1. Start the application to restore mailbox from backup and click on Login. Enter O365 username and password and click on Sign-in. Note: If there is a need to restore data in different O365 mailboxes, check Application Impersonation box. Then the software will let you upload a CSV file that contains the Office 365 account IDs and respective the PST file location. 2. 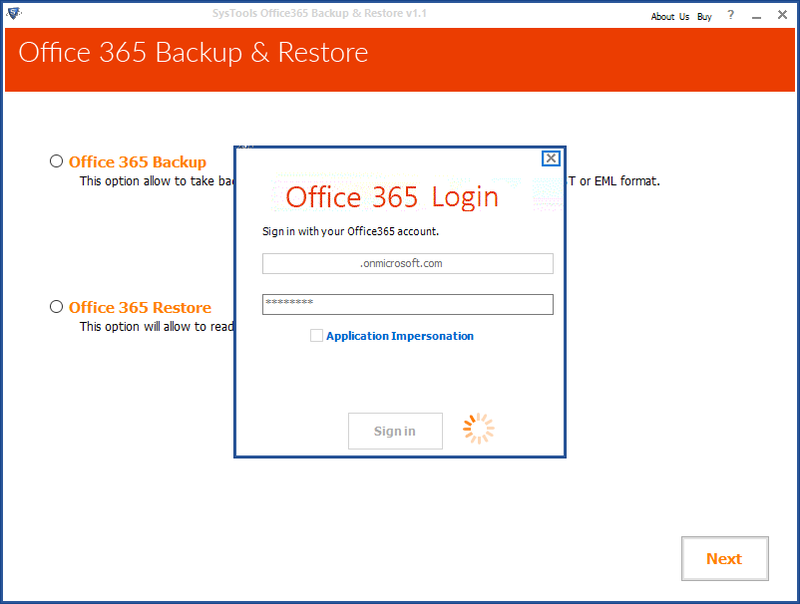 Choose office 365 Restore option and click Next. 3. Click on Browse to navigate to the PST file location and select the file. Choose the folders needed to be restored and click on Restore button. 4. A dialog box will appear where you have to select the categories you need for restoration. Users can enable Folder Hierarchy option that will create a separate folder inO365 mailbox and add all email folders in it according to original hierarchy. For emails, users can choose the date range. 5. Click on Start to begin the restore process and when it will be done, you will receive a notification. 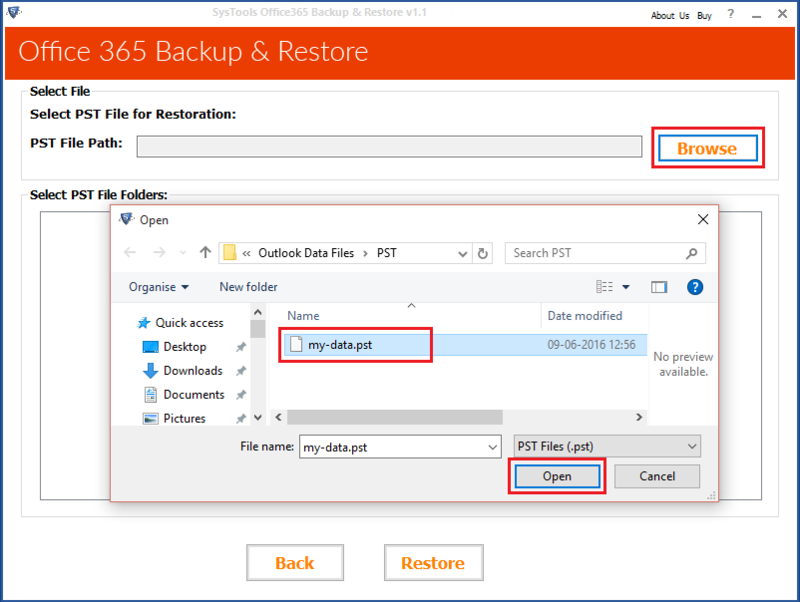 For every Office 365 user, it is important to back up their mailbox data so that they can restore them in any emergency situations. 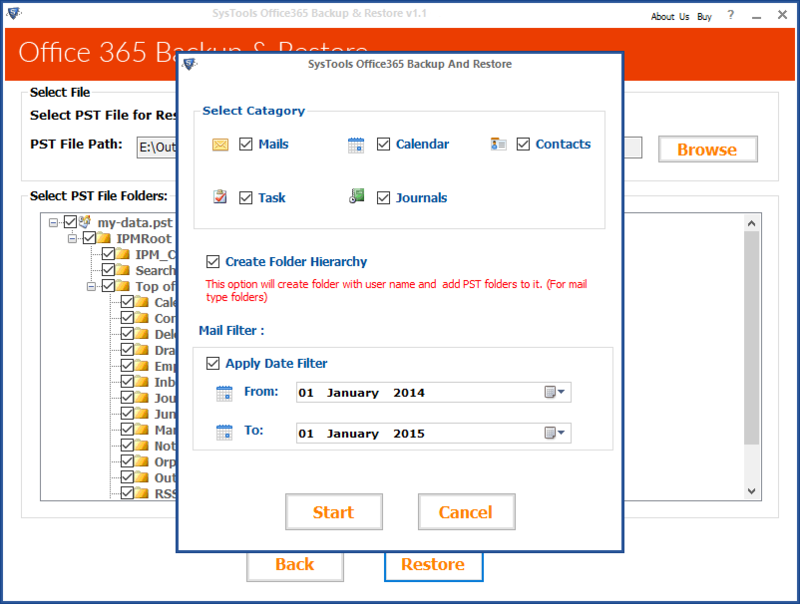 Backup and Restore Office 365 Mailbox is an efficient tool that helps users in performing Office 365 mailbox backup and restore. Here, we have discussed the stepwise guide to operate this application. Any user can follow this guide and they will be able to run this utility without any difficulty.